normal'>Career and Technical Education students had the opportunity to visit multiple manufacturing facilities during the weeks of October 1st and October 12th. Led by The Raymond Corporation for the past four years, the Enrichment Education team at BOCES invited other manufacturers to join the career exploration events. 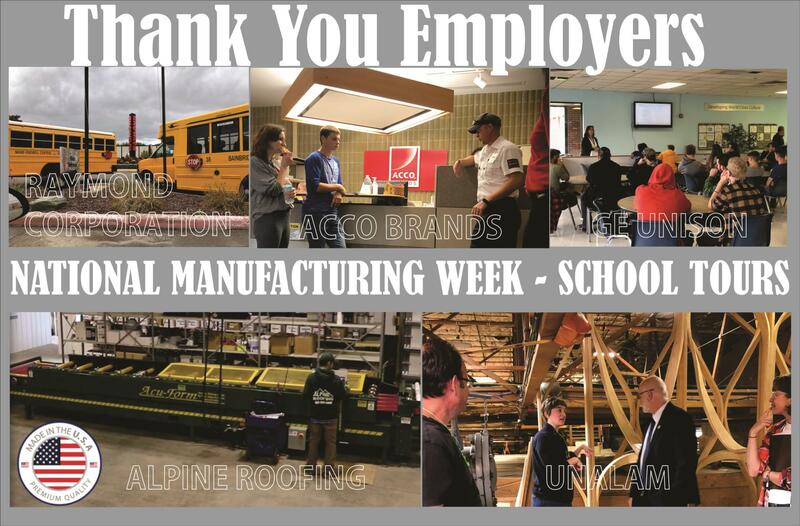 Ed Dutkowsky, Corporate Education and Development Manager at the Raymond Corporation reported that over 250 students participated in the Raymond Corporation’ Manufacturing Week event. normal'> normal'>Among the manufacturing facilities to join the celebration were ACCO Brands, one of the world’s largest suppliers of business, consumer and academic products for more than a century. ACCO welcomed students to a day of career exploration, by facilitating tours, lectures and activities to showcase the diversity of job opportunities at their plant located in Sidney, New York. normal'> normal'>District Superintendent Perry Dewey attended the tours and was excited about the learning experience, “The team at ACCO Brands prepared professional presentations and delivered a powerful message to the workforce of the future. We are pleased to have partners like ACCO Brands willing to introduce our students to the importance of ethics, responsibility, and teamwork.”normal'> normal'>Students from the Conservation & Equipment and Construction program also benefited from a tour and orientation sessions at Unalam, a custom wood manufacturer in Sidney New York. Seniors were able to view their large facility and observe the process of molding wood into high tech wood solutions for today’s building needs. The group also traveled to Alpine Metal Roofing, another building components manufacturer in Sidney New York. The team introduced students to their custom roofing projects and discussed the workforce skills needed to pursue rewarding careers in the field of manufacturing. normal'> normal'>District Superintendent Perry Dewey congratulated all of our local companies for taking the time and genuine interest to inspire young people to pursue local careers with outstanding opportunities for growth. “DCMO BOCES is committed to building strong relationships with our manufacturers as they provide competitive job opportunities for our students. Their hard work and time spent organizing these tours and presentations are highly valued. We are extremely grateful for their support,” said Dewey.